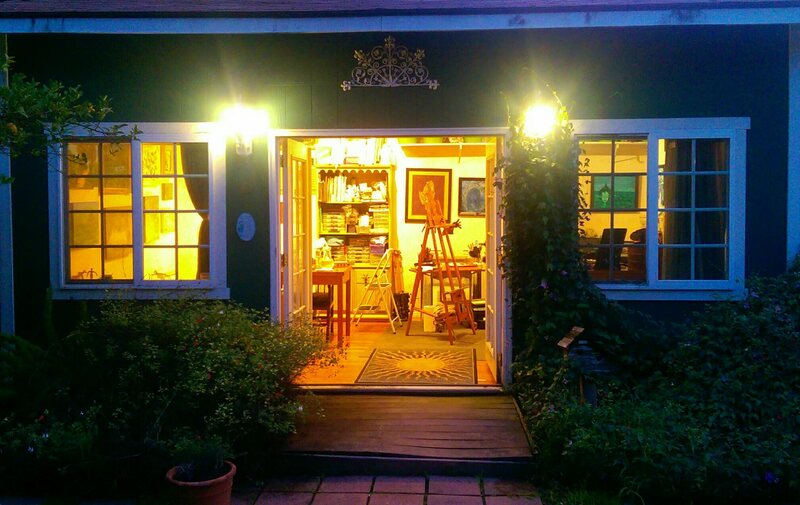 Renee Rusak Strouse, an aerial art photographer, converted the front porch of her home into a wonderful gallery. Painter Patrick Gothard showcased his paintings along with his wife Mary, who shared her hand stitched collectibles. Painter and sculptor, Ana Marini Genzon, shared a painting she had just finished as well as a collection of her recent art. You can see more of her work at her website, http://www.amgart.com. Artist Leah Knecht opened her studio and shared her large scale art as well as some of her beautiful Classic Pet Portraits and portrait commissions. You can see more of her work at her Facebook page. One of my favorite local shops HOOPLA! also hosted artists at their store as well as Sidewalk Cafe. Sidewalk Cafe hosted a group of talented artists. 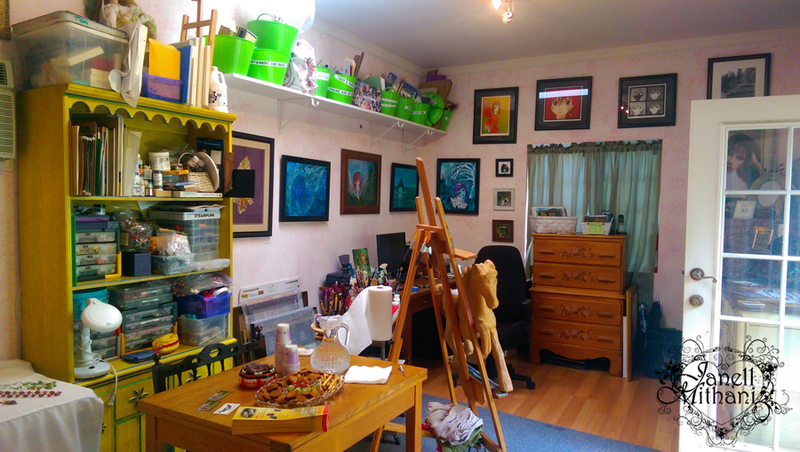 And here are another couple of pictures of my studio. I took one last picture, just as we were closing up for the day. This entry was posted in Art and tagged Altadena, art, California, open studios. Bookmark the permalink. ← Open Studios Tour is Today! Thank you Janell for sharing with us all these wonderful artists and they beautiful works of art! What a great group to be part of, I really enjoyed all of them, each is very unique and talented in they own . Happy for you and for the success of the Open Studios Tour and hereby I extend my congratulations to you all! What a fantastic day! I’m sure it was a wonderful experience. Thanks for sharing everything with us. I love that last photo–so warm and inviting! Going to these events are just magical!! Artists are just a very special breed indeed. Merry Christmas to you and your family. Thank you, Elizabeth. And Happy New Year to you, too.